We adopted Sally the Beagle from the SPCA. We have tried everything to get her potty train, she even has a personal trainer coming to the hourse to work with her. All has been in vain….new carpets here we come! Posted September 4th, 2013 . This is for outside, maybe it’ll work inside?? Anyone ever suggest putting her food dish, or any food/water dish in the areas Sally’s’ using as a toilet. Believe it or not, that’s how we taught our Kyra to stop using a certain area of the yard for her poopies. We literally started feeding her there. They won’t poop where they eat & drink. 🙂 HI SALLY……you look so cute regardless. Good luck! Might I suggest tile? Much easier to clean and area rugs are much cheaper to replace. I just put in tile that looks like hardwood. Area rugs are coming soon. Get an indoor dog potty — it’s made of fake plastic grass and pretty cheap at any petsmart or Walmart-type store. I had to rip up my carpet and lay vinyl and laminate flooring throughout. Also, the pee-pads they use in hospitals and nursing homes (you can wash and bleach them) are very helpful. I feel for you. I had a beagle that would not train years ago. Get her a psychic reading with someone with tons of animal behavior experience. DEFINITELY ~ I have used animal communicators for many many years whenever I had issues with a pet or pets and after letting the animal express itself the problem was resolved. Not sure how much you know about Beagles, but Stubborn is their middle name!!!!!!!!!!!!!!!!! She will come around. 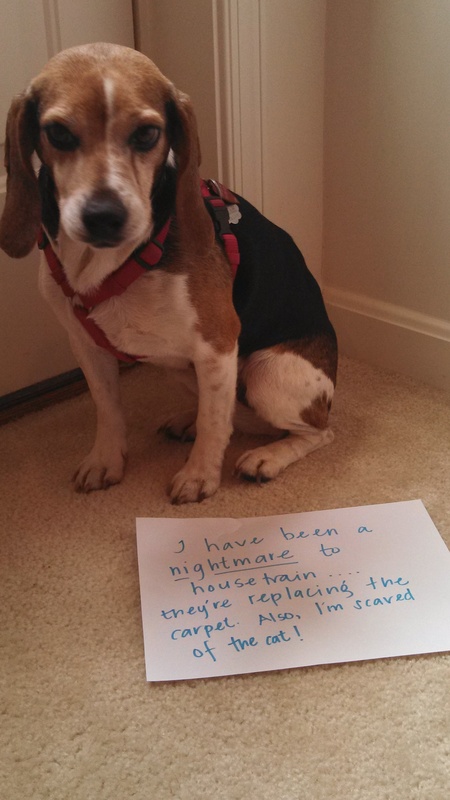 My beagle was TERRIBLE until she was two…and is also scared of cats! Once they feel confident, the things they can learn is endless! Be sure to reward her (food is probably best…she is a beagle after all!) every time she pees/poos outside. I did this with my beagle and now she will pee on command…perfect for when we are traveling with her and need her to have a quick pit stop!! (she’s a farm dog now…used to roaming on her own!) Good luck!! <3 Beagles!!! Use steak. Or lunch meat. Seriously high end treats – that’s how I trained my girl. Gotta say, they are smart, and yes, you have to out-stubborn them!! Stay out until she goes. Good luck!!! My 5 year old beagle has potty accidents all the time. They are really hard to train. My beagles potty accidents are directly linked to her anxiety. Yeah, beagles can be super stubborn. Part of it will be Timing. Timing her “go out” time for the right time after you fed her. Also helps to use the rag/towel you used go clean up, outside. This helps tell her “do this, here”. But it really can be a test of the wills, and people do win, most of the time. My Gal Sal is right now having the same problem. She’s a bed wetter too. I was just holding her and she peed on me! She is very smart, I don’t know what the heck the problem is. We have gone back to crating her at night because I am tired of the rug shampooing. Kennel train, maybe? and kudos to you for adopting and not giving up on this sweet baby!! Try taking her water and food away an hour before bed. And taking her out before you go to bed and again first thing in the morning. Maybe she has a weak bladder? What a beautiful face – bless u for taking care of her! We adopted Oakley, a border terrier from a rescue org. Even though he was a year and a half old, he was never potty trained (sadly the case with some sheltered dogs). He didn’t understand that he was even doing anything wrong. I read articles that said it can take time adjusting to home, other pets, everything. We learned his schedule be writing down everytime he went for a day and stuck to his schedule. Then we gave him treats as rewards and tons of praise. It took about 2 months but he eventually built up bowel and bladder control! Try anti icky poo for the carpets, floors etc. And taking away the water bowl 2 hours before bed. Good luck! Beagles *NEVER* have any issues .. but when they do, they just look at you and we melt ..
yes, beagles are very sweet, but hard to house train, she can still smell the spot no matter how well you clean it, you could try to clean with a neutralizer, it worked with my beagle and now she rarely has accidents or on purposes. But once you get past this, you will see that you’ve picked quite a good little companion and family member! I completely understand your pain. My four yr old beagle is difficult too. 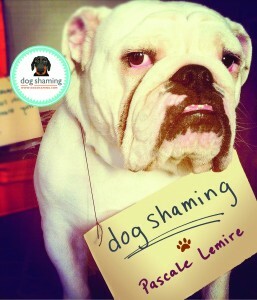 She was born in a puppy mill and learned at an early age that material soaks up urine. Peeing on her bed and carpet is normal. Argh!